Thank you both for making our wedding ceremony so memorable. 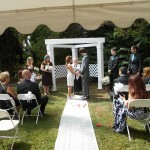 Your words were beautiful and everyone remarked that the ceremony felt very ‘personaL’ and ‘warm’. Your husband’s help was invaluable and we are so thankful that he could attend. We will not hesitate to recommend you to others. Bill and I wanted to thank you so much for officiating at our beach wedding on September 13! It was truly a perfect ceremony. 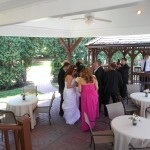 We enjoyed working with you (and Tom) and appreciate helping our big day to be perfect and run smoothly. Thank you for making our ceremony match us and our love perfectly! It has been wonderful working with you and we truly appreciate all you have done to make our day special. Just wanted to thank you again for your beautiful contribution to Nick and Erin’s wedding on Saturday. The ceremony was incredibly touching and very meaningful for all of us there. We truly do appreciate your insight and expertise – you really did make this a very special, meaningful event. Thank you so much for helping us have the wedding ceremony we wished for! Everything was amazing and cannot thank you enough. Thank you so much for performing our wedding ceremony. You did a beautiful job tailoring it to make it special to us. Thank you for making our day. You truly know how to write a beautiful ceremony. We really appreciate it. Thank you for making our day so special. 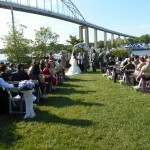 You wrote a beautiful ceremony and I received many compliments on it afterward. We really appreciate your driving all the way to Rising Sun for our special day. I will recommend you to anyone in need of a wedding officiant. We just wanted to take a moment to say thank you for signing on last minute and giving a flawless ceremony. You were great! Thank you for making the planning process go so smoothly. It really was a pleasure working with you. Thank you so much for giving Peter and I the wedding of our dreams. The ceremony words are perfect and it was a beautiful day. We were very impressed with you and your husband! You both made our day go smoothly. Your service was perfect. Thank you for everything! Thank you for an amazing ceremony!! You did an incredible job out in that heat. Everything was perfect!! I couldn’t have dreamed of a better turn out. You and your husband are a great team!! I also want to thank you for taking the time to do our rehearsal and your patience in dealing with us all. I know it was a little crazy evening. I want to thank you and Tom so very much for making our wedding a special one. A wonderful, peaceful time was had by one and all. We could not have asked for a better ceremony. I felt like I found an Angel at a very hectic time. Edie was thrilled and very pleased with the entire service as was I. Take good care of yourselves and I cannot wait to tell everyone how wonderful this experience was from beginning to end. You both are very special people. Be blessed. Just wanted to say thank you for helping to make our wedding ceremony a special one. 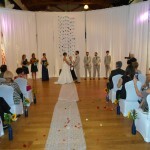 We received a lot of compliments from our guests about the content and flow of the ceremony. Maureen and I certainlu enjoyed working with you to put it together. Thank you for the flexibility in the process. Betsy and I want to thank you again for helping us make our wedding day something we will always cherish. We couldn’t be more pleased with the beautiful ceremony you helped us put together and for making it flow so well. We definitely made the right choice by selecting you to marry us and will always be thankful. Robert and I would like to thank you for making our wedding so beautiful. All of our family and friend commented on how special the service was. Thank you for putting so many personal touches to our day. It is a day we will cherish forever. I wanted to comment on the level of service we received from Patricia Painter. My husband and I are in an interracial couple, and I was raised Catholic while he was raised as a Jehovah Witness. We currently belong to a nondenominational church, and didn’t know what direction we would take in finding an officiant when we were to get married. We are both very spiritual people who love each other more then anything else in this world, and that is what we wanted to focus on. We were referred to Patricia from our florist, and the minute we met with her, we knew she would be perfect for what we wanted. She had us fill out a questionnaire, and asked us all about our relationship, including how we met, what type of relationship we have with our families, and most importantly, what our expectations and desires were in selecting an officiant. Patricia was a blessing to us in so many ways, and there in no other person we could have had as our officiant that could have made the day any more beautiful!!!! Very open-minded and flexible. Made our day special! I just had to send a thank you for the wonderful job you did at our wedding. So many people have since come up to me and have asked “who was your minister, she was just great.” We hope you enjoyed the festivities. It was a wonderful day in part because of you. Thank you from the bottom of my heart. John and I would like to say thank you for a wonderful ceremony. It was so perfect and you did everything we wanted, so we just wanted to say thank you and we appreciate everything you did to make our day so special!